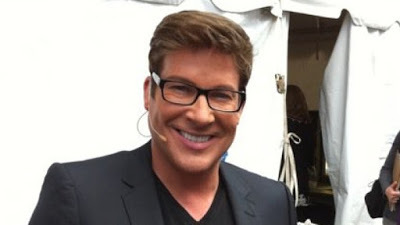 CANADA: Gay Talk Show Host Christopher Hyndman Found Dead In Toronto Alley - Joe.My.God. The body of Christopher Hyndman, co-host of the afternoon talk show Steven & Chris on CBC-TV, was found in an alleyway in Toronto’s east end Monday night, police confirm. “It is with profound sadness that we share the news Christopher Hyndman died,” said the public broadcaster in a memo distributed to staff Tuesday afternoon. “We extend our deepest sympathies to Steven [Sabados], family, friends and colleagues; our thoughts are with them all.” Toronto police told CBC News on Tuesday that Hyndman, 49, was found without vital signs in an alleyway near the intersection of Queen Street and Broadview Avenue shortly after 11 p.m. ET Monday. CBC arts reporter Eli Glasner said the scene was near the apartment where Hyndman lived with Sabados, his off-screen partner and television co-host. Toronto police Det. Terry Wray said the investigation remains “completely open.” He added that police would not comment further until completing interviews. Hyndman was co-host of the show with Steven Sabados, who was also his real-life partner. They were co-stars of the original Designer Guys show in 2001 as well as Design Rivals (2003) and So Chic with Steven and Chris (2005) before launching their afternoon talk show. The pair formed the Sabados Group Inc. in 1992, specializing in event planning, product launches and set design, his CBC biography says. A 2013 profile of Hyndman and Sabados by Xtra, then Toronto’s gay newsmagazine, called them “Canada’s gay-lifestyle TV guru couple” whose show Steven and Chris was “a bona fide hit for CBC” and aired in more than 70 per cent of the market on ABC’s Live Well Network. The couple told Maclean’s magazine the same year that they had met in a bar in 1988 when they both were working at CityTV. Reruns of Steven & Chris have been pulled off the air. Below is the most recent clip posted to the show’s YouTube channel.